If you think Strawberry Shortcake is one of those little pre-packaged cake cups and a bag of flavored syrup you find in the grocery store, then you just don’t know what you’re missing. 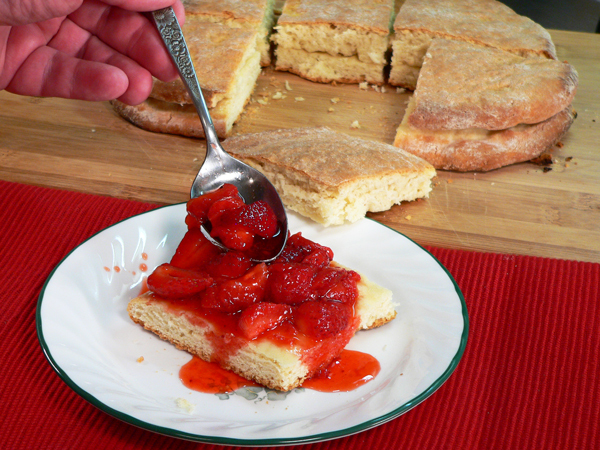 You’ll love this rustic Strawberry Shortcake Recipe, adapted from a 1928 cookbook with it’s crusty bread layers and sugared fresh Strawberries. Just add whipped cream topping and dig in. Probably like you, I pretty much grew up on Strawberry Shortcake that began with one of those little cake cups. You know, the ones in that little package that you always see beside the fresh Strawberries each year. They usually come about 6 to the pack and they’re conveniently stacked in the fruit and produce section right beside of the seasons supply of fresh Strawberries. And, more times than not, you’ll find those bags of Strawberry “gel” that you’re being coaxed into thinking is the perfect way to add some juice to your berries. What’s up with that? Probably, like you, whenever I want to try something a little different in the kitchen….I drag out a couple of cookbooks and start reading. Or, I jump online in search of something to try. Nothing wrong with that….I enjoy doing both. I love the Internet because of all the great, tasty looking pictures that usually accompany a recipe or article. I just wish some of the older and, I do mean older, cookbooks had those same great pictures. Alas, it was a different time and a different world back then. We’ve had a great season for growing Strawberries here in the South this year of 2012. Warmer weather provided us with delicious fresh Strawberries a good week or so earlier than in years past. Can’t argue with that. However, the season has just about ended I’m afraid. I was told just yesterday that my favorite Strawberry Farm would probably be all out by the end of this coming week. We’ve got lots of rain and hot days coming up in this week after Memorial Day and, that’s probably going to wrap it up for us. Here on Taste of Southern, we’ve been busy the last 4 weeks making all kinds of things with fresh, locally grown Strawberries. We’ve made Strawberry Cobbler and Mama Ruth’s Strawberry Cake. We’ve frozen sliced Strawberries with sugar and stacked a few containers in the freezer. We’ve frozen a couple of bags of whole Strawberries. We’ve made fresh Strawberry Jam and canned a few jars that will hopefully last us until next year. Seems like we were just getting started and all of a sudden, they’re almost gone. Please, don’t let the season end just yet. I still hope to prepare and can some Strawberry Preserves using some smaller, whole, fresh berries. I’ve put my order in for another bucket already and just hope I can find the time to complete them. I’m already thinking about what to enter in our local and State Fair’s this year and I think Strawberry Preserves could be a good choice. Last year or so, when I really started getting serious about creating the Taste of Southern website, I was reading any and everything I could find about cooking here on the Internet. A couple of interesting articles, mentioned a lady by the name of Mrs S. R. Dull. Mrs Dull was the author of a cookbook entitled “Southern Cooking” that was originally published in 1928 and repeated again in 1941. She was the Former Editor of the Home Economics page in the Atlanta Journal Magazine section and, she was a Cooking School Instructor. I tried to find out more about the book and ended up finding a copy up for bid on EBay. I placed my bid and won the auction. As I recall, I paid less than 10.00 for the book and getting it shipped to my home. There are lots of great old recipes and some enduring comments throughout the book. Chapter One of her book begins with, “The Kitchen.” She writes about the Utensils, Stove, Time Table, Measurements and Refrigerator for the home kitchen. Her first line states, “The woman is the heart of the home, and the kitchen is the heart of the house.” Gotta love that. Page 200 is where I found her recipe for Strawberry Shortcake. 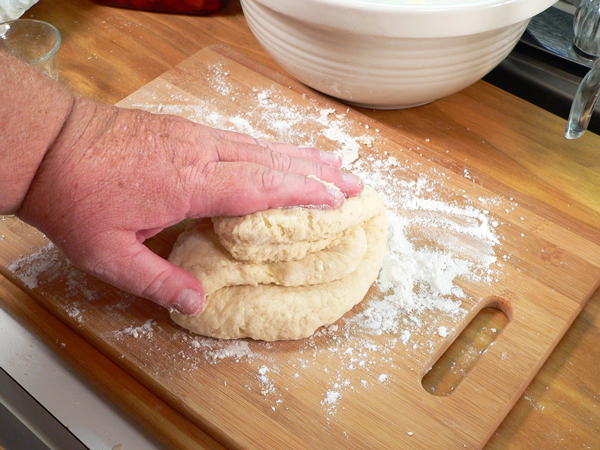 All of the other recipes I had found before this one, called for round shaped biscuits cut out of dough. Hers on the other hand, described a couple of sheets of dough, placed one on top of the other and filled with freshly sugared berries and topped with whipped cream. It just struck my fancy so I set out to give it a try. The recipe was simple enough and used ingredients already on hand. As I mentioned, I even had some Strawberries so, I was good to go. And, with some Strawberries already sliced and sugared in the freezer, I can easily see using them during the middle of this winter to enjoy this great taste all over again. As you’ll see below, the bread came out just a little toasted around the edges. I was trying to make sure the cake was fully baked. As it turned out, the dark edges just added to the look and feel of this rustic, crusty type of bread…er…cake. I loved it. When I started viewing the finished photos on my computer, it looked even better to me. I could just see this bread having been recently pulled from an old wooden cook stove with a wood fired oven. I could practically smell it’s aroma as the wood burned away, baking the breads and cakes that would have been prepared for the day. I imagined it to be a very special day, maybe a birthday or, some grand celebration. It was all good. I’m sure every bite of that bread would bring out little hints of wood smoke and it having been baked in that old oven that had to be kept going by adding more pieces of wood along the way. Electric stoves were available back in 1928 of course. They were only good though if you actually had electricity at your home. I guess it depended on whether you lived in the city or way out in the back woods as to what type of cook stove you might have used back then. Some of the best pizza I’ve had came from a brick oven fired with wood. It’s a unique taste when you get that wood flavor baked right into the bread. I’m sure that back in 1928 and, even long before, this Shortcake probably had a very similar flavor as well. I was almost envious of the way folks baked breads back then but, I quickly snapped out of it and was thankful I didn’t have to go out and chop up any wood before I could start baking. Sacrifices must be made it seems. So, I do hope you’ll give this recipe a try. It’s really quick and easy and, as mentioned, an entirely different pleasure of tastes from anything you’ll find pre-packaged in the store. The step-by-step photos are just below along with a printable recipe at the bottom. 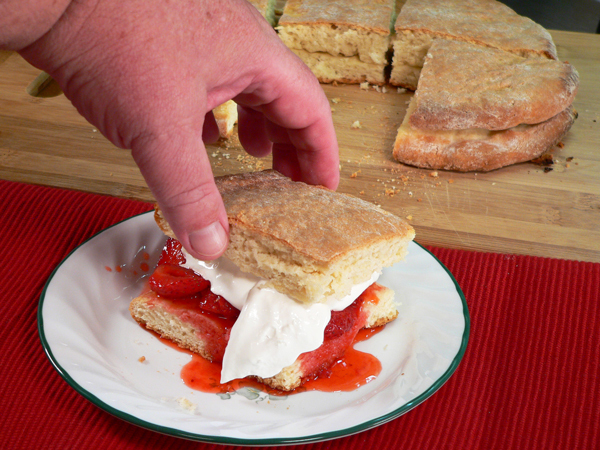 If you try it or, just want to share some of your Strawberry Shortcake memories…please leave us a Comment below. That way, we’ll know you stopped by for a visit. If you’re ready to take a step back in time, grab an apron and…..Let’s Get Cooking! 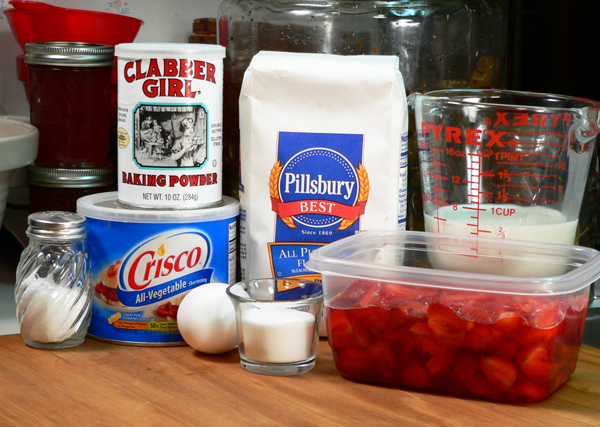 1928 Strawberry Shortcake Recipe: You’ll need these ingredients….and a little whipped topping of your choice. Grab a large bowl and your sifter. 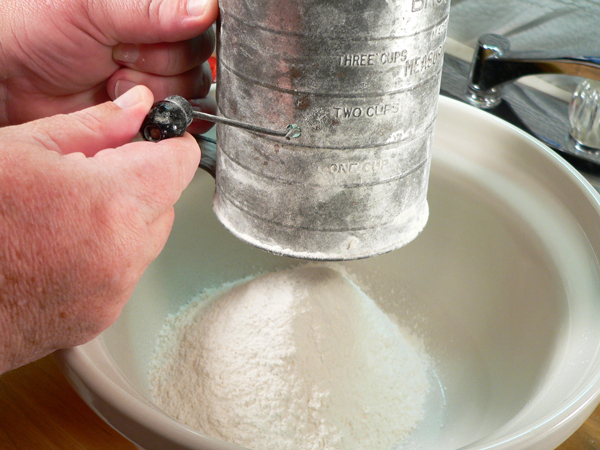 Measure out the flour as you add it into the sifter. Sprinkle in the needed amount of salt. The recipe in the book called for adding all the dry ingredients together to be sifted. Seems I got a little ahead of myself with the next step and forgot to the add in the sugar. What was I thinking? Be smarter than me, learn from my mistakes and….go ahead and add the sugar at this point. While it didn’t really make any difference I’m sure, I will have to add mine a few steps down below. Then again, we could use this as a teaching moment to explain that even though you might make a mistake here and there as you cook, you can probably recover and keep on going. Yeah…tha’ts what it was…a teaching moment. I feel better about it now. Thank You. 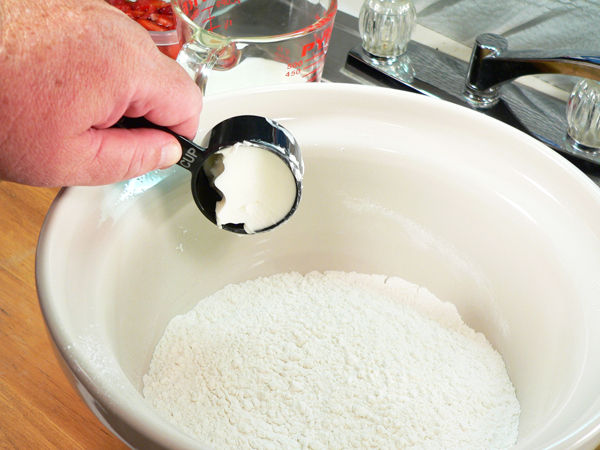 Crank the handle and sift all the dry ingredients into your bowl. 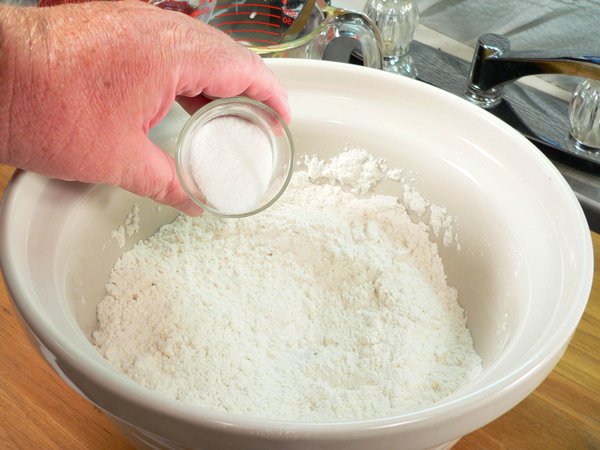 Toss away any hard pieces left inside the sifter…or bugs. Wait, just kidding about the bug part. Of course, it did use to happen. We had an old “Hoosier Cabinet” in our kitchen. It had a fancy BUILT IN flour compartment with a sifter on the top left side. While sifting the flour helped break up any lumps, the fine mesh of the sifter could also keep any bugs from….never mind….let’s move on. Sifting is just fun to do….so sift and enjoy. Cut the shortening in with a fork. 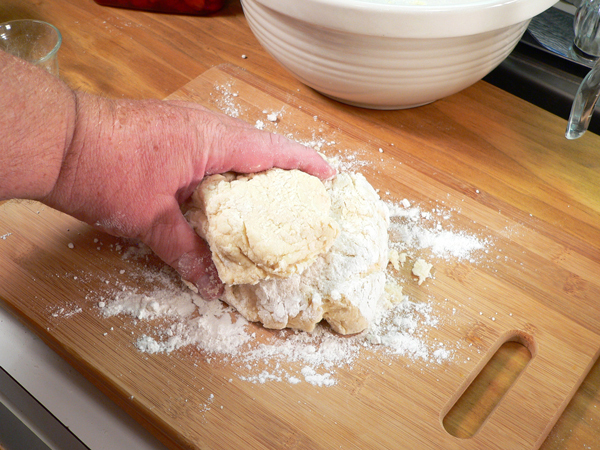 Just take the fork and mash the shortening…or cut it into…the flour. 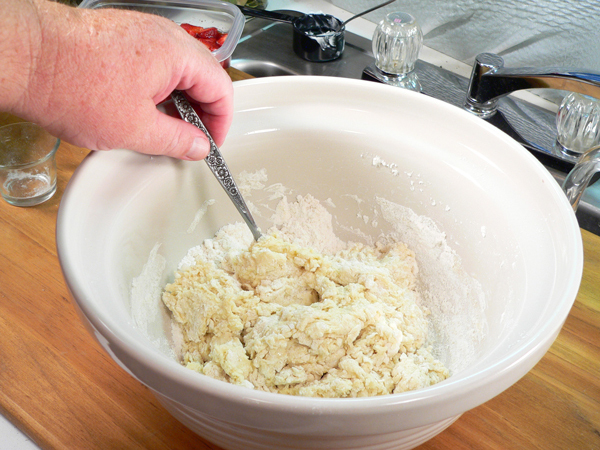 Keep mashing the large pieces until you get it all mixed down into the flour. You’ll see little pieces of it, smaller than a pea size and, that’s what you’re looking for. It only takes a minute but work it down as best you can. Here I am adding the sugar that I forgot to add before sifting. It’s not even enough to really make a difference in the taste but, I did finally get it in there. Measure out 3/4 cup of “sweet milk” as the recipe called it. Then, crack open one egg and add it into the milk. Whisk it all together. Flashback: Did you ever milk a cow? How about gather eggs from the hen house? I did help get eggs a time or two as a child but, I never actually milked a cow. I don’t recall my family ever owning a cow when I was a kid. Maybe they did before I was born. One of my uncles had one and I watched my aunt milk that cow numerous times. I’ve always thought I’d like to give it a try at least once though. As for the eggs, we did raise chickens in my youth so I’d help mama sometimes bring in the fresh eggs. It’s strange but the older I get, the more I think about wanting to have my own little garden and maybe raising a few chickens for the eggs. You ever have those thoughts? 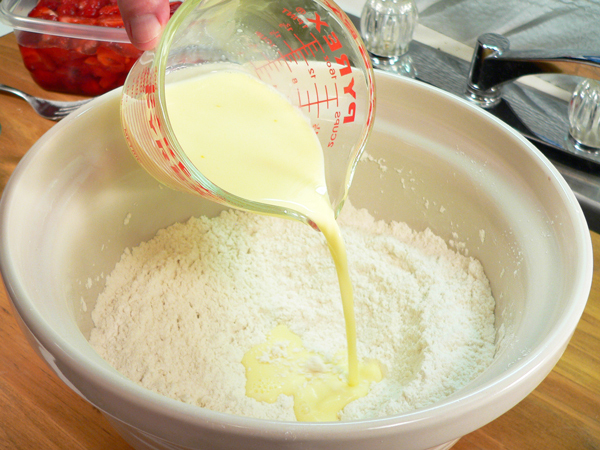 After you whisk the egg and milk together, form a small well in the flour and pour the milk mixture in. 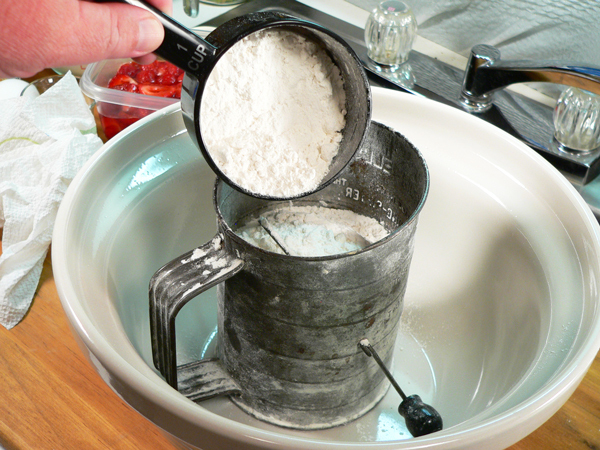 Use a fork and stir the milk mixture into the flour until it starts to form the dough. You’ll need to just jump right in next and, start mixing the dough by hand. It will be a little sticky but, just keeping working it around and try to get it all to mix together. This step is best performed using both hands but, I had to use the right one to snap the picture you know. In case you’re wondering, I’m actually “right handed” but, all of the pictures show me working with my left hand because I have to use the right hand to work the camera. You need to know important stuff like this. I’m glad to share it with you. 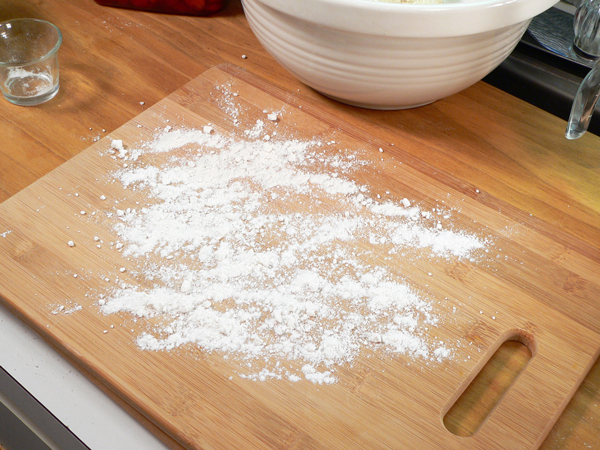 Grab a small amount of flour and toss it out across your counter top or work board. 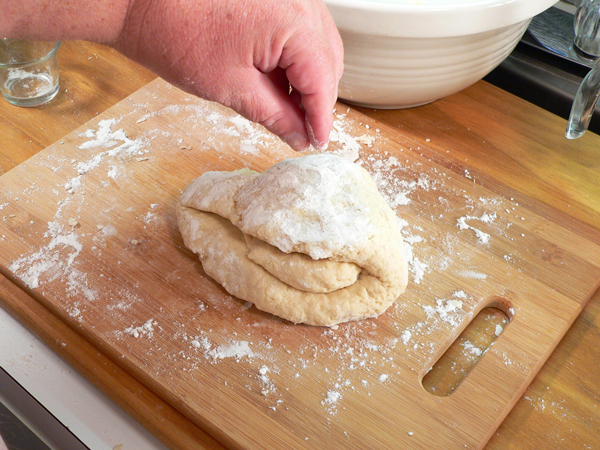 Use both hands and continue to toss, flip and turn the dough until smooth on the outside. After you’ve worked all the dough together until it’s smooth, shape it into a ball and place it on the board. Gently pat it out into a circle. 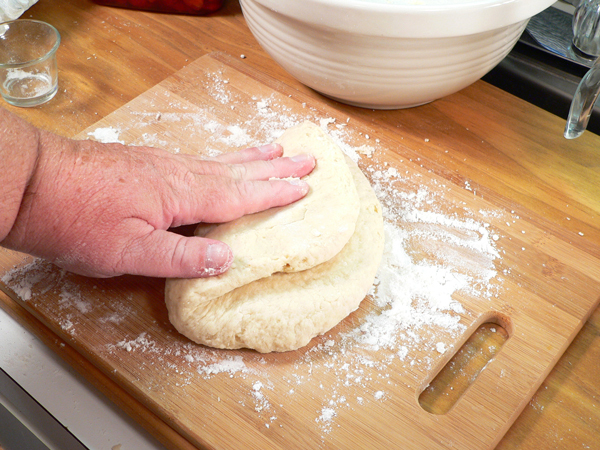 When working with the dough, if it’s too sticky, just add a little more flour on top and keep working it until it’s not sticking all over your fingers. I know it really needs a little more explanation if you’re a beginner. But, just refer back to the pictures if possible and work your dough until it looks similar. We want to knead the dough a few times. 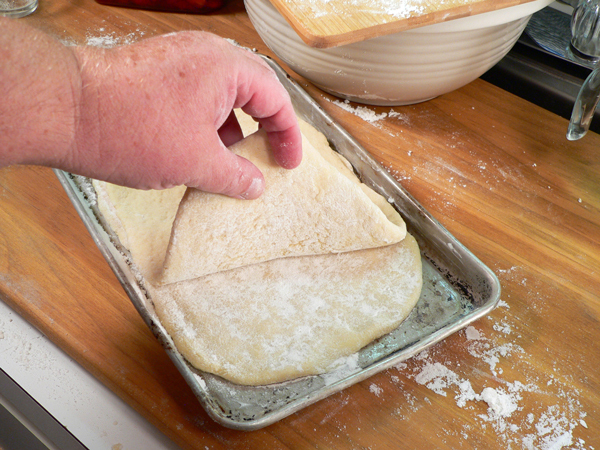 Take the left side of the dough and fold it over onto the right half. 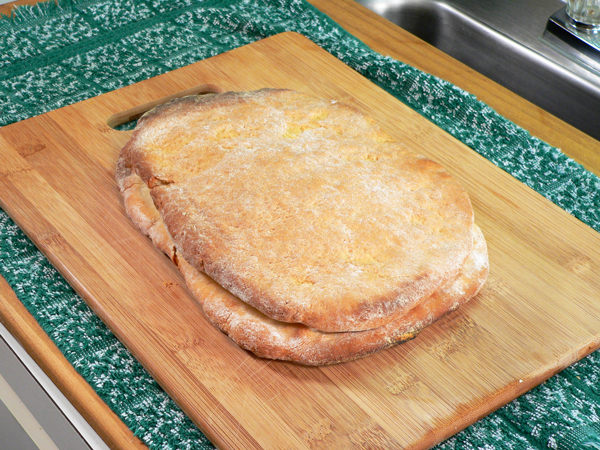 Grab the top half of the dough and fold it down onto the bottom half. 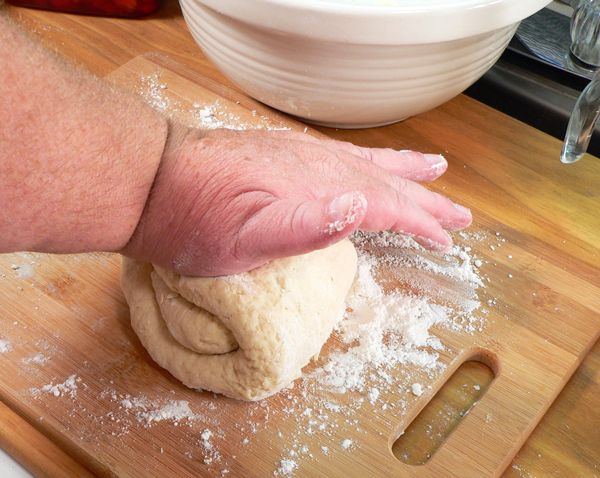 Turn the folded ends of the dough to your left, as pictured, then use the heel of your hand to firmly press the dough together. You’ve just kneaded the dough one full turn. Pat it back out into a circle again and repeat this folding, turning, pressing process a couple of more times. 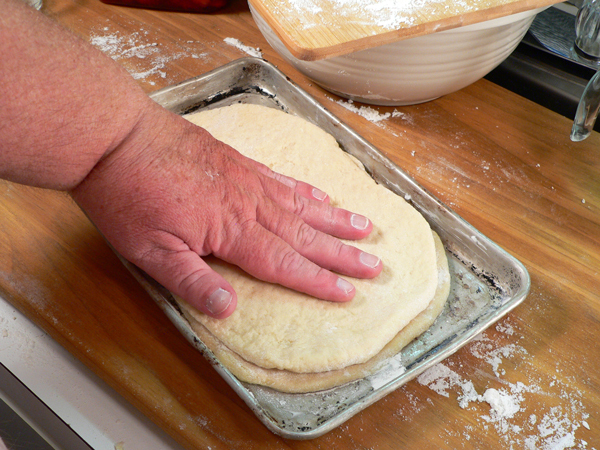 If the dough sticks to your fingers or the counter, just sprinle it with a little more flour and work it in. 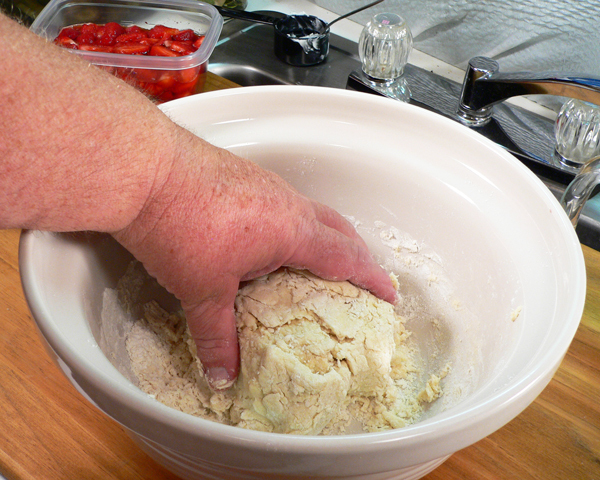 After you’ve kneaded the dough a couple of turns, use both hands and shape the dough into a ball. 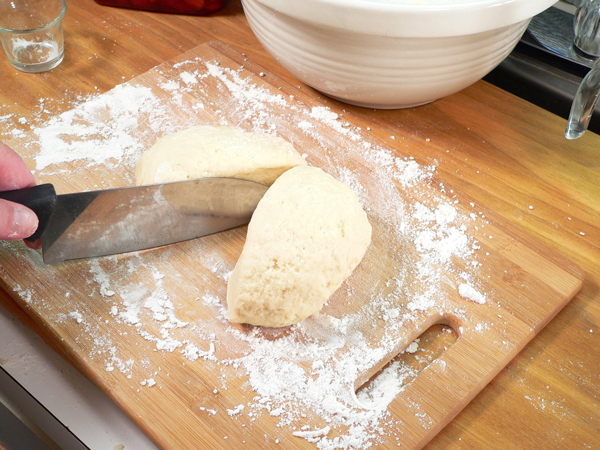 Place the ball on your counter top and use a knife to cut the dough in half. Take each half and, using both hands, shape each one into a rounded ball. Place it back down on the counter top and just let it rest for a minute or two. Just loudly speak out and tell the dough to “STAY.” It will follow your every command. Well, at least it did for the Pet Rock that I once owned. Remember those? We thought that was really a cool trick for a Pet Rock to be able to do back then. Simple times huh? Grab a small baking pan or sheet pan and grease the bottom. I just used a little more of the shortening and spread it out evenly across the bottom with my fingers. 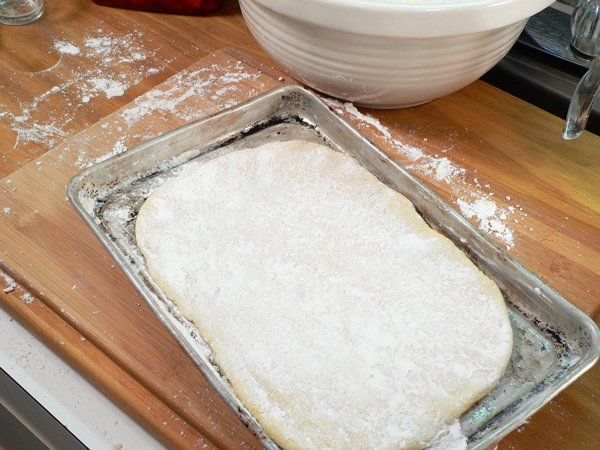 Take one of the dough balls and shape it into a rectangle. 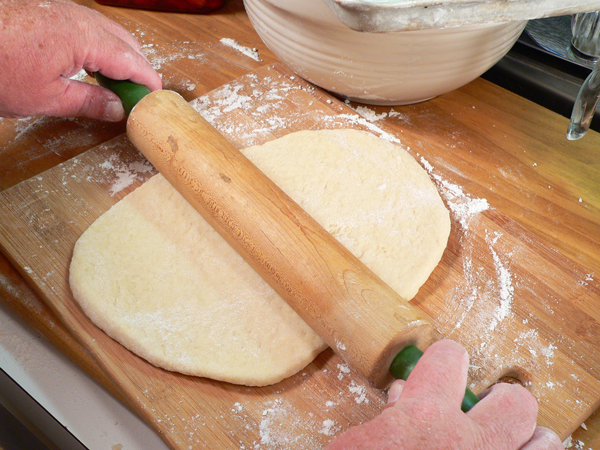 Use a rolling pin and gently roll the dough out into a larger, flatter rectangle. 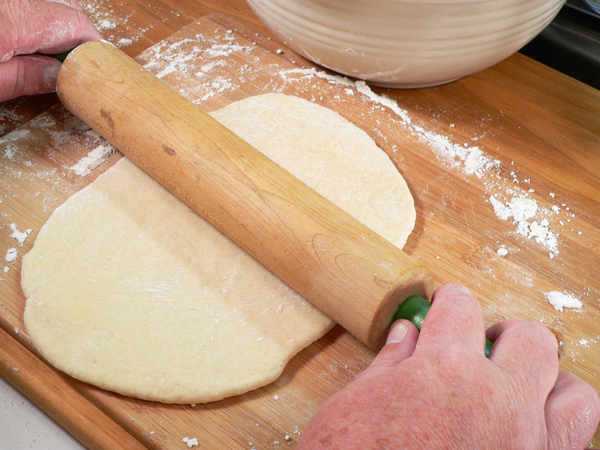 You’ll need to rub the rolling pin with flour and probably will need to add some flour to the dough a time or two as you’re rolling it out to keep it from sticking. It’s truly a learned process and…that’s what you’re doing now…learning. I’m so proud of you. I know you can do this. Don’t have a rolling pin? You could just work the dough by hand and pat it out into a large rectangle as well. You’ll want to keep it about one half inch thick. 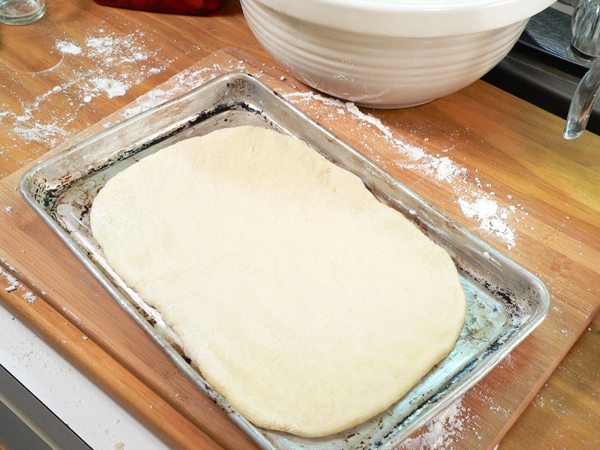 Carefully lift the rolled out dough from the counter top and place it in the greased pan. It didn’t reach the sides and I didn’t expect it too. It adds to the final presentation by it not being pressed into the pan to fit. A flat cookie sheet would have worked just as well but, I grabbed what was nearest at hand. Grab some more flour in your hand and generously sprinkle it all over the top. Tap the pan or brush away any clumps of flour. Just keep a smooth layer of flour on the surface. You really want a good amount. We’re going to add another layer and bake the entire thing together. Then, we want to pull the top and bottom apart. The flour at this point helps to accomplish this. Take the remaining ball of dough and repeat the process. Roll it out on the counter top just like you did with the first piece. Now, carefully lift this second piece up and, place it right on top of the heavily floured first piece. They should align up pretty close to same size but it’s not important that they be exact. Use your fingers and gently press the top layer down. Just lightly…remember we want to be able to pull them apart after it’s baked. That’s it…time to bake it up. Place the pan on the middle rack of your pre-heated oven. BAKE: Bake the cake at 400º for about 25-35 minutes. Start checking it often after about 25 minutes so it doesn’t get too brown or burned on top. It’s just too easy to walk away and let it brown too much. Try to stay with it at this point. Oven’s vary so your cooking times will vary. After it’s baked, remove the cake from the oven and sit on a towel or wire rack to cool for a few minutes. After a couple of minutes, grasp the top end with your fingers and carefully begin to lift it up. It should still be plenty warm at this point so be careful and don’t burn your fingers. This is where that flour pays off that you sprinkled on top of the bottom layer. Mine lifted right off without any problems at all. I placed both halves on the towel I had on the counter top. Then, I just took part of a stick of butter and rubbed it all across the top. You could melt a little butter in the microwave and brush it across both halves just as easily. 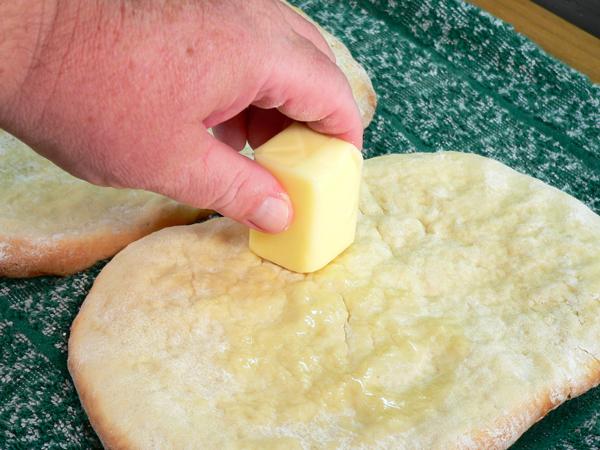 You just want to be sure and brush the tops….or insides…very liberally with butter. Place both layers back together on top of a cutting board. See how rustic looking it is. The top and bottom halves aren’t matching exactly but, I think that just adds to the appeal. Take a large knife and cut right smack down the center of both layers. Use a good sharp knife and enjoy that crunchy sound it makes as you cut it in half. I cut each half into thirds. You could cut it smaller…or larger…depending on what you prefer. I’ll get SIX SERVINGS from this cake. When you’re ready, plate it up. Mrs. Dulls original recipe called for just placing berries on the entire bottom half and working up from there. I didn’t want to go that route as I thought it’d be easier to serve by cutting the slices first. 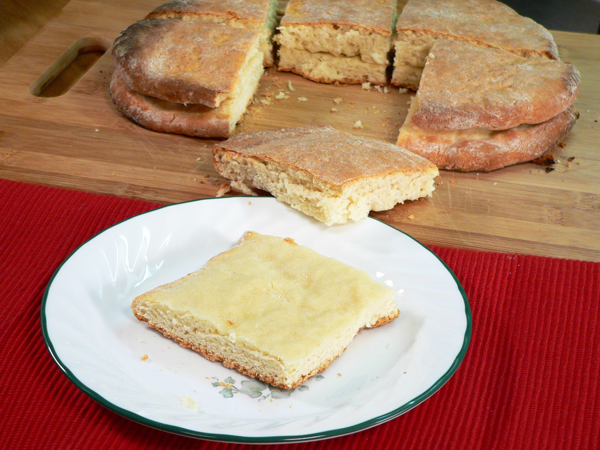 It’s texture is more that of a crusty bread than a soft layer cake. It would certainly work either way and might make a good presentation if you did it that way though…it’s your choice of course. For my single servings, I placed the bottom slice on a small serving plate. This is where a lot of juice in your berries will come in handy. 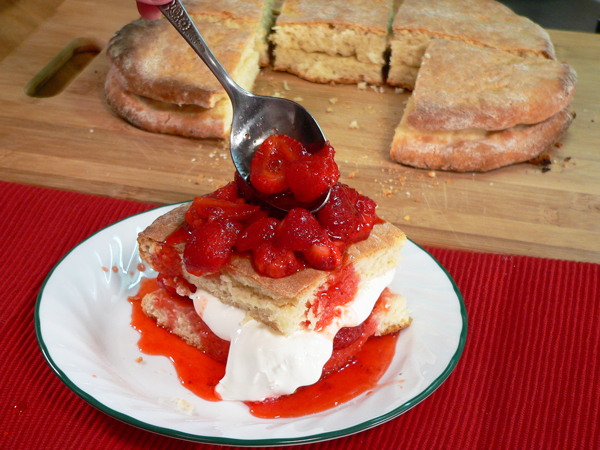 Spoon a layer of Strawberries on top of the bottom slice of the bread. 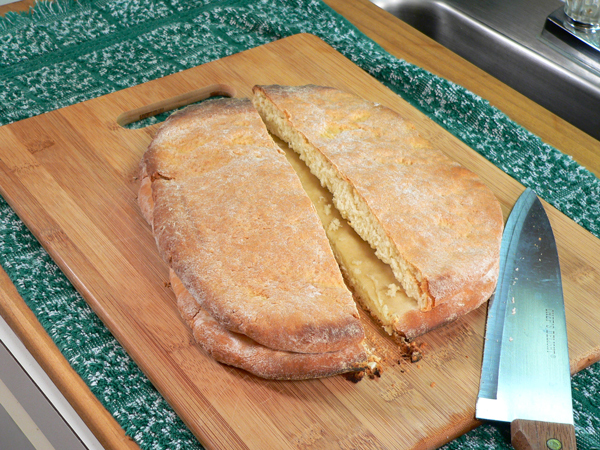 Since it’s more of a bread type texture, more juice is needed to soak down into the cake. You could always just add some more sugar into your berries prior to creating the servings….that way…you’d be sure you had enough juice. And, with so little amount of sugar actually used to make the cake, the berries need to be sweet enough for both. When I do this again and, I’m certain I will, I think I’ll make some homemade whipped cream to serve with it. For now though…Cool Whip is going to work fine. Scoop out a big spoonful and place on top of those delicious Strawberries and all that sweet juice. Place the top layer of the cake on the top of the whipped cream. Spoon on some more berries and juice. Oh my goodness….I can’t hardly wait to dig in. Add a smaller dollop of whipped cream to the top of that layer of berries. Take a fresh Stawberry if you have it and slice it so you can fan it out on top of the whipped cream for the final presentation. YES…it was awesome. I truly loved it….once I was certain I had a picture of it all. Once the juice starts to soak into the cake…it just keeps getting better and better. 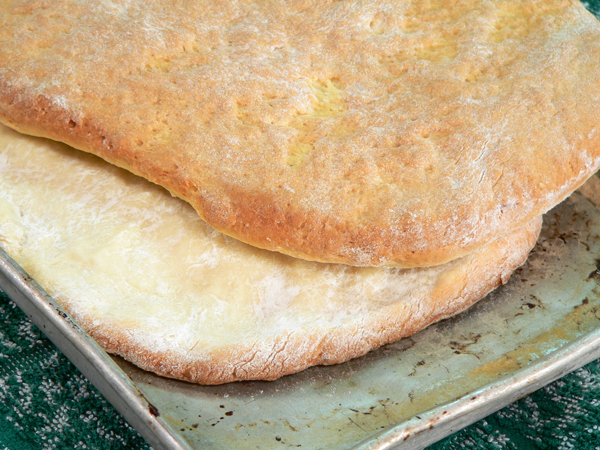 As I said, this really is more like a bread texture than a soft cake…or at least that’s the way it turned out for me. Bread is my biggest food weakness. So, this was just right up there to be one of my favorites. I’m not saying I’ll never have one of those pre-made cake cups again. Someone is more than likely to serve them to me somewhere. But, now that I’ve tried this, I’ll certainly do it again. And, I hope I brown the edges next time as well so I’ll think back once again on how this might have appeared coming out of an old wood stove and wood fired oven back then. Nice going Mrs Dull. I’m glad we’ve met and I loved the recipe. NOTE: Southern Cooking by Mrs. S. R. Dull was published in 1928 and 1941, according to my copy, by Grosset & Dunlap Publishers of New York. Illustrations by Lucina Wakefield. Copyright 1928 by Mrs. S. R. Dull, Atlanta, Georgia. Printed in the good old USA. You might find one on Amazon or might want to check out Ebay if you’re interested in obtaining a copy. If you think Strawberry Shortcake is one of those little pre-packaged cake cups and a bag of syrup you find in the grocery store, then you just don’t know what you’re missing. 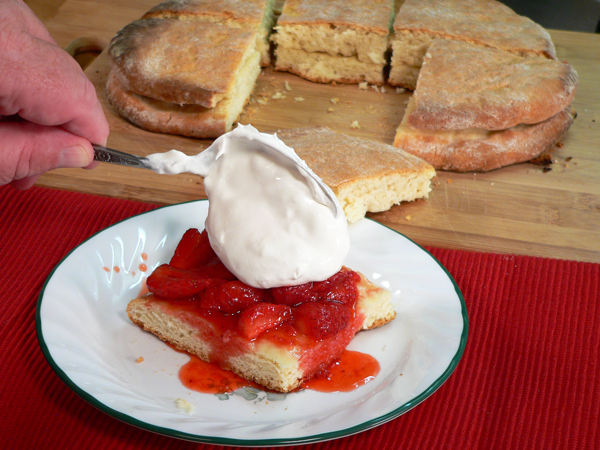 You’ll love this rustic Strawberry Shortcake Recipe, adapted from a 1928 cookbook with it’s crusty bread layers and sugared fresh Strawberrys. Just add whipped cream topping and dig in. 2 cups of Strawberries prepared with sugar. 1/3 cup of Shortening, Crisco etc. 1 container of Cool Whip or Whipped Cream of choice. 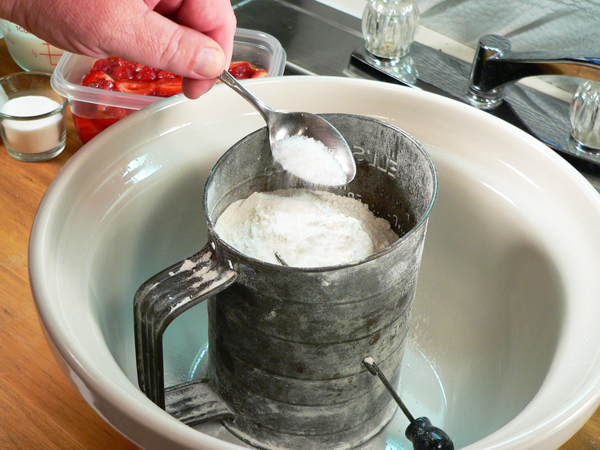 Place all dry ingredients, flour, baking powder, sugar and salt in a sifter. Sift into a large mixing bowl. 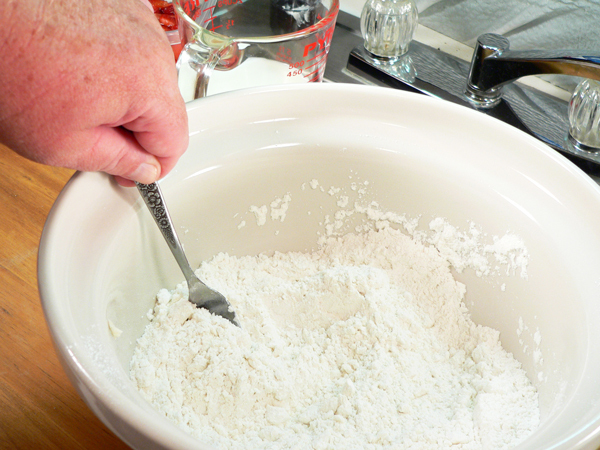 Add the shortening, cut into flour with a fork. 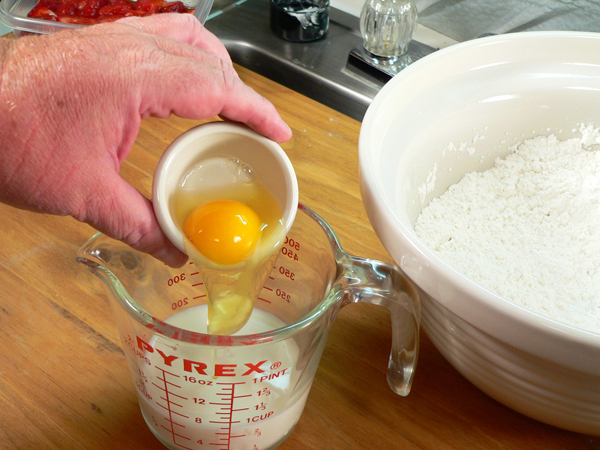 Break egg into the measured amount of milk. Whisk together. 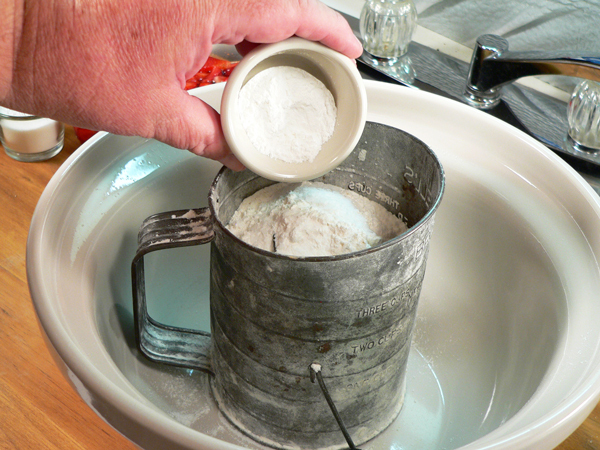 Pour the milk mixture into a well formed in the flour mix. 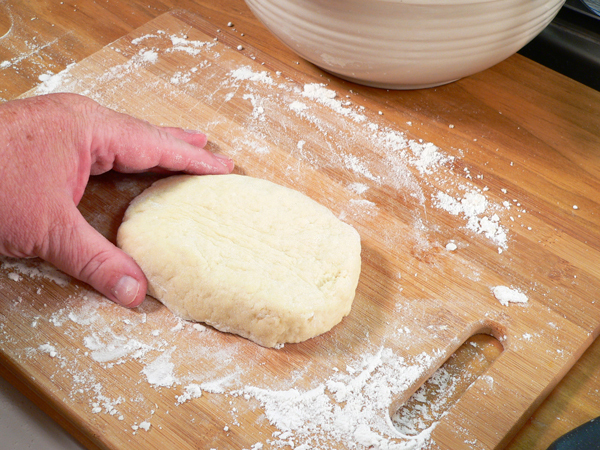 Use a fork and stir together to form a dough. Remove from bowl and place on a floured counter top or board. 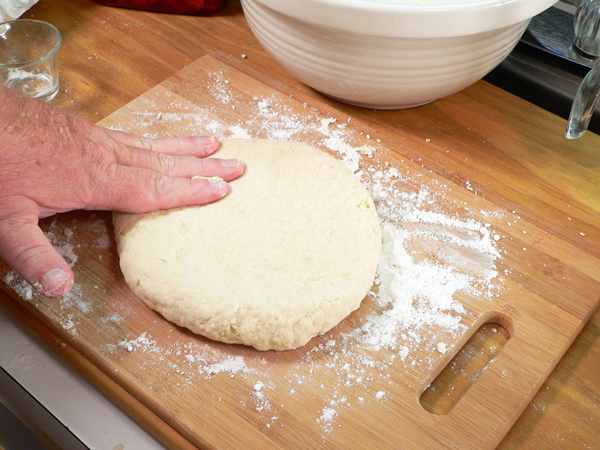 Shape the dough into a ball, pat into a circle about one inch thick. Cut the circle into half. Shape each half into a ball. Let dough rest for a few minutes. Flour the surface again. Roll out each half into a rectangle about 1/2 inch thick or just pat out by hand. 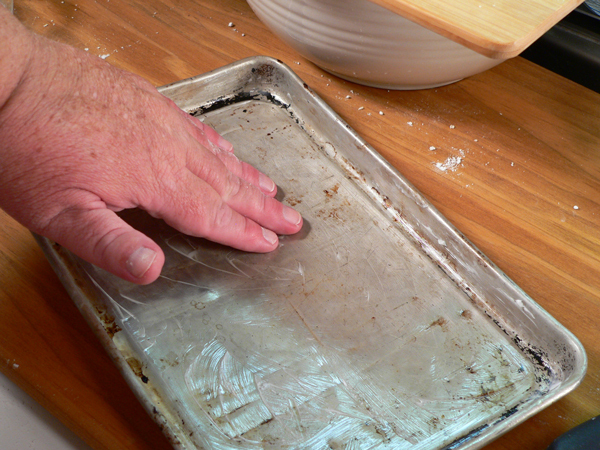 Grease a baking sheet or baking pan with shortening. Place the rolled out flour dough into the pan. Sprinkle the top generously with more flour. Brush away any lumps. 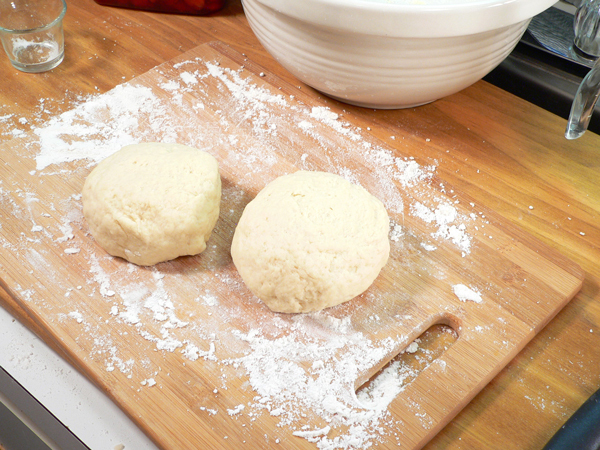 Roll out the remaining dough ball and place on top of the first already in the pan. Bake at 400 degrees for about 25-35 minutes, until done. Remove from oven, place pan on towel or rack and let cool about 5 minutes. Carefully lift the top layer up from the bottom layer and set aside. Brush the inside parts of both layers generously with butter. Place the two pieces back together. Cut in half lengthwise, then into thirds to make six servings. Place the bottom layer of one section on a serving plate. Top with sugared berries and lots of juice. Add a good scoop of whipping cream. Top this with the top layer of the cake. Add more berries and juice, a little more whipped cream and, then garnish with a fresh Strawberry, fan sliced. Prepared Strawberries with Sugar: We suggest you use 1 cup of Sugar per One Quart of Fresh Strawberries for this recipe. Strawberries must be capped, washed, sliced and combined with sugar. See our recipe for Freezing Strawberries with Sugar for more information. 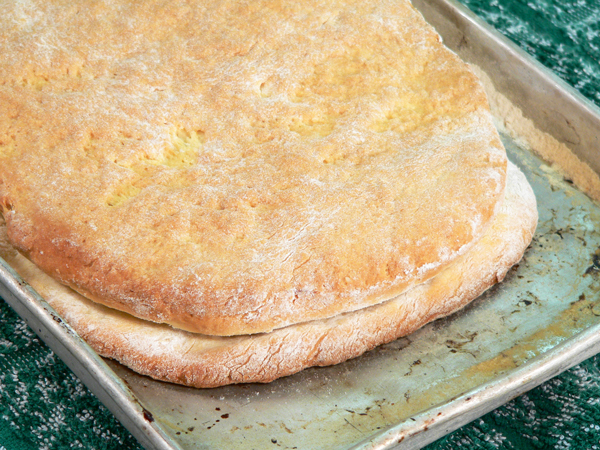 Visit our website at www.TasteOfSouthern.com for step-by-step photo instructions on how to do it. 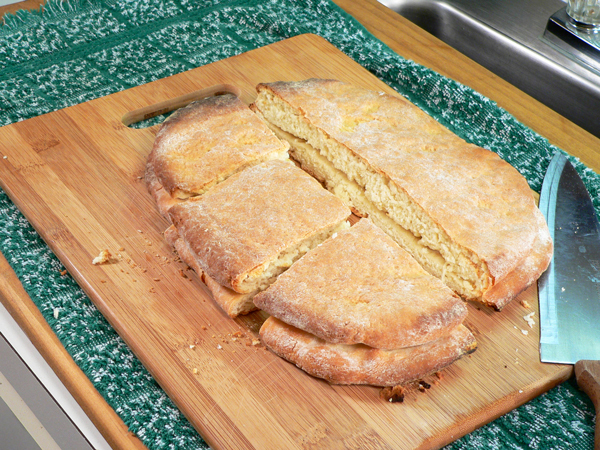 This recipe is adapted from the cookbook entitled “Southern Cooking” by Mrs. S. R. Dull. Publised by Grosset & Dunlap of New York. Copyright 1928 by Mrs. S. R. Dull of Atlanta Georgia. Second Printing, 1941. Your Comments: Thank you for visiting Taste of Southern today. I’m excited that you stopped by and, I hope you’ve found something that might cause you to try out one or more of our recipes. The only way we really know that you paid us a visit is by your Comments in the section below. Should you care to take just a moment to respond, I’d be most grateful. As you can imagine, preparing each recipe takes a bit of time. I’d really love to know if you ever try out our recipes and look forward to your Comments. Share your recipe results or, just share a family memory. Either way, let me say Thank You in advance. I read them all and will try to respond to your reply here on the same page as time permits. I hope you’ll like it. Please come again real soon. I just bought my strawberries for this year today. They were sweet and juicy. I make frozen jam with mine. That is how the kids and grand kids like them. I make it and give almost all of it away so others can enjoy them too. My husband just likes to put sugar over them and eat them with sugar cookies. Your shortcake sounds like his kind of eating so I may just have to make one. Sorry you still have vertigo. I had it once and that was enough, not fun for sure. Glad for the update on Billy and Jan. Wish the best for all of you. Enjoy your recipes and visits always. Stay positive and we know who holds tomorrow. Thanks for stopping by our house. The recipe calls for shortening but fails to mention it in the directions. I’ll just mix it in the dry ingredients before adding the milk/egg. Thought you would like to know, photos show it. Making it now. Keep up the good work, Steve!!!! Hi Steve. I really enjoyed reading your newsletter today. I’m sorry to hear your vertigo is still keeping you confined to home. I’m happy to hear your friend Jan is doing better now. Your home delivery stories are the main reason I’m writing you this morning. I went to my son’s house yesterday for Mothers Day dinner with all the family. For my Mothers Day gift, my son and his wife gave me a one-year paid membership in Shipt, a grocery delivery service sponsored by Publix where I do all my grocery shopping anyway. I’m certainly going to use it. I don’t think the drivers will have any problem finding my house. i may have a problem shopping sitting here with my iPad in my lap. I’m not very computer “savvy”. I always take advantage of Publix sales and BOGO’s, so I’m going to regret having to tip the driver. Smile. But I will do it anyway. Have a great week. I must try this recipe soon while we are still getting strawberries here in Florida even though they come from California (so says the package). However, I must tell you I had to chuckle while reading about you sifting flour. The reason being – my daughter who is 50 plus now, wanted to help me bake cookies when she was a little girl. She thought it was fun to sift flour. My sifter looked just like yours. The only problem was that when she sifted all of the flour into the bowl, and the little lumps didn’t go through, she turned the sifter upside down and dumped them into the bowl of sifted flour. I saw her do this and couldn’t move fast enough to stop her. We still laugh about it. She is now a gourmet cook – much better than I. Have a great week. Hi Steve. Just ran across your page while looking for a recipe for sweet potato biscuits. The cook book you are referring to is great. I’ve inherited three copies. My grandmother’s, great aunts & aunt. I’ve been using the shortcake recipe for years. Can’t find one any better! The only difference is I use the round cake pans and don’t cut it until it’s all put together. Looks great on the table! It’s a family favorite on the 4th and at special family gatherings. Love your website! I just finished making the shortcake and it turned out great! This is the way my Mother used to make it. I haven’t tasted it yet, trying to wait until after dinner, but it is so tempting. Thank you for this recipe. I know I will be making this many times during strawberry season. We loved this strawberry shortcake! The ‘cake’ part was just what I hoped for – sturdy enough to hold up to the strawberry syrup, but soft enough to soak some up to sweeten it, and easy to make. It was so delicious layered and topped with the strawberries and (fresh) whipped cream that I had to promise to make it again soon. I’ll definitely make this my go-to strawberry shortcake recipe, and plan to also try it with blueberries when they’re ready to pick this year. Thanks again for the recipe and illustrations. 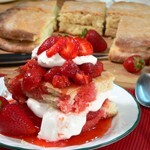 Hi Sharon, Thank you for your comments on our 1928 Strawberry Shortcake recipe. I’m delighted to hear that you tried it and that it turned out well for you. Perhaps you will encourage someone else to try it out. I’m sure it will be good with some Blueberries as well. Good idea. We just got our first batch of the season’s fresh strawberries today, and this recipe is going to be one of the ways I use them, it looks delicious! I’m very familiar with the little store bought shortcakes, and I don’t like using them because they’re so sweet and spongy. I want a cake/biscuit/bread that is tasty, not too sweet or spongy, and lets the strawberries be the “star” of the dessert. 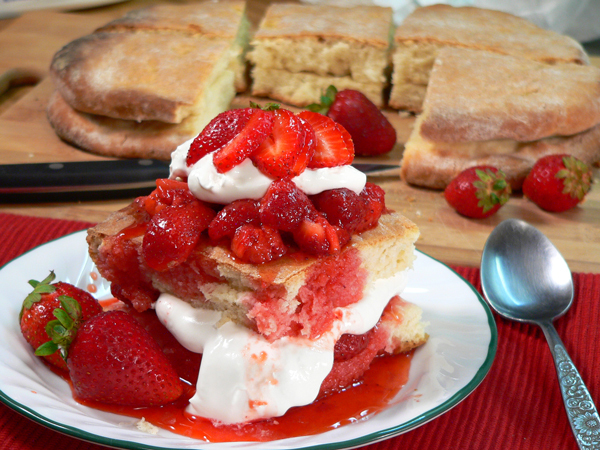 This recipe reminds me of strawberry shortcake that my grandma made, but I never got her shortcake recipe before she died. One of my favorite childhood memories is picking strawberries with her in her strawberry patch. Of course it was hard to not eat more of them than I put in the bucket 🙂 But the payoff for filling the bucket was all the delicious ways she came up with to eat them…on pancakes, shortcake, pie, and making jam or preserves to spread on hot biscuits. Thank you for the recipe and the colorful, detailed directions, I can’t wait to try it!! Hi Sharon, Thank you for sharing your memories of picking Strawberries with your Grandmother. Lucky you for getting fresh local strawberries already, we’re still waiting on them here. Hi Rene, It’s my pleasure to share the recipe, and I do hope you’ll try the Strawberry Shortcake. I think you’ll like it. I can’t wait for the return of fresh Strawberries in our area. Hard to think about that today, what with 6 inches of snow on the ground, but it’s right around the corner.